If you are in need of some short term funds and need them quick, your choices are either personal loans or gold loans. 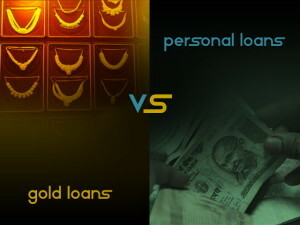 Let us look at which one is better and when should you choose Gold loans over personal loans. Often I come across people needing urgent cash invariably going for personal loans. Their reasoning is that it requires very little paperwork, you don’t have to mortgage anything and it is processed quickly. While these are valid points but the major issue is the rate of interest on personal loans that make them among the most expensive borrowing options. 1. Simple Eligibility Criteria: Personal Loans though quick, do need you to fulfill certain eligibility criteria based on your repayment potential and your nature of work etc. and often self employed or salaried professionals face rejections or increased paperwork to get a personal loan. This process is very simple and straight forward in case of gold loans. The only eligibility for Gold Loans is that you should have Gold to pledge and its value should be 10-15% higher than the amount your are seeking; for example if you need a loan of 85,000, you need to pledge gold worth Rs, 1,00,000. 2. Lower Rate of Interest: Personal Loans are notoriously high in interests and they range from 14-20% or even higher in some cases. Gold Loans usually have interest rate between 12-15%, depending on the purity and value of gold. Also you can negotiate the interest rate if you pledge higher value of Gold or hallmarked Gold for availing loan. If you pledge the Gold which is 30-40% higher in value to the loan amount you seek, the rate of interest comes down. Lot of people do this to save on the interest bit. 3. Minimal Paperwork: Even though personal loans give eligibility in ‘one minute’; the amount of paper work does involve your proof of ID, income, residence, proof of work etc. as it is an unsecured loan. Banks are doubly cautious in case of personal loans due to this reason. In Gold Loans, the paper work is only limited to your proof of ID and residence. This is because they have your Gold which they can use in case you do not pay up or don’t settle the loan. 4. No Credit checks: Again, being an unsecured loan; Personal loan needs credit checks to be done on the applicant and check his or her credit rating and any discrepancies in that will lower or even negate your chances of getting a personal loan. Gold Loan is however a secured loan as mentioned above and does not require credit checks and your credit rating does not matter in this case. 5. Quick sanction: Personal loans even though quick will take time for sanction and disbursement and this can be anywhere from 3 working days to even 10 days in some cases. Gold Loans are the quickest as the disbursement is done within 24 hours and in some cases on the same day itself. This is also why Gold Loan will be favorable in case of some medical emergency or any other urgency requiring you to need some extra cash up front. 6. Flexible repayment option: For personal loans you need to shell out principal plus interest every month in the form of EMI as repayment towards your loan. However in case of Gold Loans you have the option wherein you only pay the interest till the end of your tenure and the principal amount in lump sum at the end. This is best suited in case where you are in need of funds today and a certain investment matures a year later or your funds can be arranged in some time in the future. While you need the cash right now, you need not liquidate the investment prematurely as you can repay the principal from the maturity amount in lump sum at the end of the term and till then just repay the interest in EMI. Also Read: Why are Less number of People Opting for Loans? 7. No processing Fees and No pre-payment Penalty: Personal loans attract processing fees for the sanctioning and processing your loan application. There may also be some prepayment penalties in case you foreclose the personal loan before its term. Gold Loans have no such additional expenses either in way of processing fees or pre-payment penalty. You can pre-pay the loan anytime during the tenure without paying extra. It is safe to say that in the battle of Gold Loans VS Personal Loans, Gold loans win on a lot of grounds. The only thing is ensuring the safety of your Gold and for that is advisable to opt for Banks or reputed financial institutions so that your Gold is safe. However you do need to keep certain things in mind before opting for Gold Loans in India that you can find here.